The U2331A offers multifunction capabilities in a module. It can be used like a digital multimeter in polling mode. It can be transformed to be a simple scope using the continuous mode with simple triggering capabilities. No matter if it is used as a standalone module or when plugged into a U2781A USB modular instrument chassis, the synchronization and triggering capabilities allow great flexibility in making the desired measurements. With the analog output being able to send out predefined or arbitrary waveforms make this a good tool when closed loop feedback or stimulus is required. The digital IO channels allows for closed loop control through connections to switches, relays and solenoids. The burst mode enables the U2331A to simulate simultaneous analog input acquisition. The U2331A works together with an optional U2901A or U2902A terminal block for easy connections. 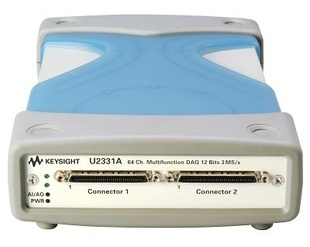 Giving users more flexibility, the U2331A is compatible with a wide range of application development environments such as Keysight VEE, MATLAB® R2007a, NI LabVIEW and Microsoft® Visual Studio®. The U2331A is ideal for design validation and manufacturing engineers who conduct data logging, measurement or monitoring in a broad range of industries. This module is especially useful for customers who would like to make physical measurements.